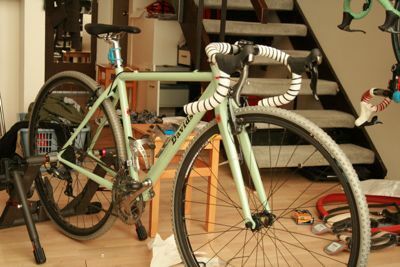 Technically, this is the first bike I’ve owned with Dura Ace 7900 components. It was a rocky start; the right STI was defective out of the box. This is so rare an occurrence that I continuously struggled to make it work for 3hrs before I substituted another lever on the bike to confirm the failure. But Shimano warranteed it immediately, so the story can move on. p> The new 7900 levers have a lower mechanical advantage against the calipers than previous generations. 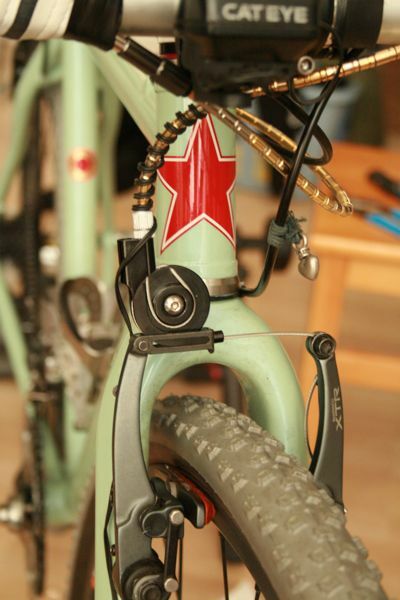 This makes the new levers a better match for use with V-brakes (linear pull cantilever brakes), though one still needs to use a cable pull amplifier (ie Problem Solvers’ “Travel Agent” adapter). I’m pleased with the results so far. Lots of power, reasonable modulation, zero squealing. In order to get adequate braking force before running out of lever travel when using older generation STI controls and Travel Agents, the pads had to be set very close to the rim. However with the greater cable pull of the 7900 levers, this is less of a problem and also the system feels less “mushy”. Stopping force is more controllable, there being less of the on/off feel. p> I’m trying out the bike with old Cinelli deep drops, the #66 style otherwise known as Campione Del Mondo. Because I’m using a modern 31.8mm stem with a 26.0 bar, I had to get an adapter (again from QBP’s “Problem Solvers” brand). The adapter is a shim that fits in the clamp area. I was afraid that the shim would look super cheesy, but on the contrary it is quite discreet. 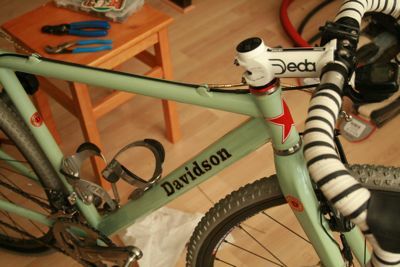 The deep drop is a somewhat odd choice for a cross bike, since the current trend is towards shorter reach/drop bars with a variable radius bend, but more on this later. Other pieces that I’ve not used before: Crank Bros “Directset” headset, Hutchinson CX tires (both the “Bulldog” and Piranha” models), and the Fizik Tundra saddle.